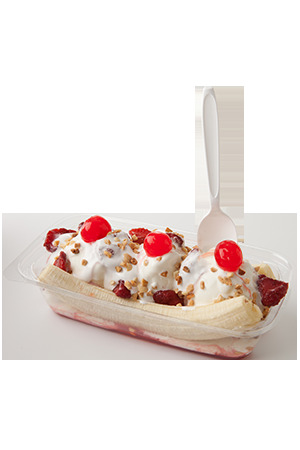 Andy’s vanilla custard and a whole banana covered with delicious strawberries, marshmallow crème, crushed nuts and topped with a cherry. Andy’s vanilla frozen custard and a whole banana covered with hot fudge, crème caramel, roasted pecans and topped with a cherry. Vanilla frozen custard covered with hot fudge, crème caramel, roasted pecans and topped with a cherry. Vanilla frozen custard and homemade brownie covered with hot fudge, roasted pecans and topped with a cherry.